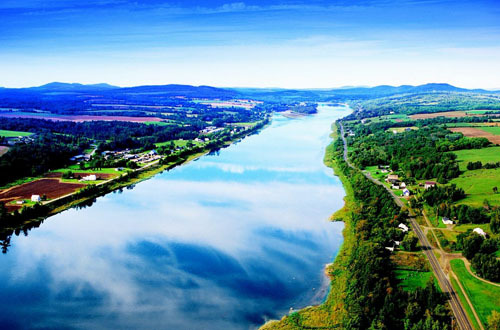 Experience the Maritimes with its own way of life and enjoy the relaxed atmosphere of countryside and city. Learn all about the Scottish, Acadian and Native heritage widely celebrated in the Atlantic Provinces. 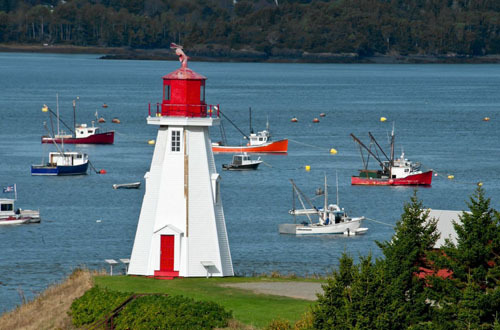 Get a glimpse of Nova Scotia’s picturesque fishing villages, and see the rugged coastal landscapes along New Brunswick’s shores of the Bay of Fundy. Experience magnificent vistas, thrilling adventures, charming villages and fascinating cities. 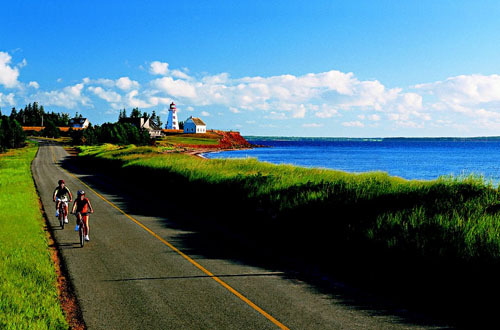 Highlights include Prince Edward Island, Cape Breton, Bras d’Or Lake, St. Andrews by-the Sea ,Oak Island and Cabot Trail. 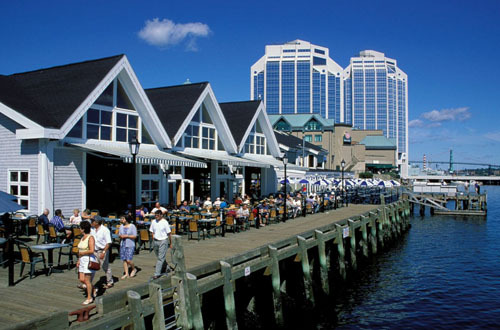 Arrive in Halifax and transfer independently to your centrally-located hotel in this vibrant and cosmopolitan urban centre on the Atlantic Ocean. Meet your tour director and fellow travellers this evening at a welcome reception. Overnight in Halifax. Explore the Bay of Fundy and learn about the world’s highest tides as we travel its colourful coastline to New Brunswick’s bilingual city of Moncton. En route, we visit the Joggins Fossil Cliffs, a UNESCO World Heritage Site. See magnificently exposed layers of rock revealing the world’s most complete fossil record of life in the “Coal Age” of 300 million years ago. After crossing into New Brunswick, an unforgettable culinary experience awaits as we cruise the warm waters of Shediac Bay aboard a lobster boat. Learn about the fishing industry and savour a delicious lobster supper. Arrive in Moncton later in the day. Overnight in Moncton. Continental breakfast, lunch and dinner included. Experience a true natural wonder this morning as we visit the Hopewell Rocks on the coast of the Bay of Fundy. Marvel at these massive flower-pot shaped formations sculpted by the highest tides on the planet. We travel through Fundy National Park on to Saint John on the southern New Brunswick coast. After a city tour including the Reversing Falls, we check into our hotel for the evening. Overnight in Saint John. Breakfast and lunch included. Today we enjoy a day trip to picturesque St. Andrews by-the Sea where the quaint charm of this coastal town captivates every visitor. After a whale watching boat tour (weather permitting), the afternoon is yours at leisure to experience the friendly people, beautiful architecture, and rich marine life of this seaside gem at your own pace before we return to Saint John. Overnight in Saint John. Breakfast and lunch included. 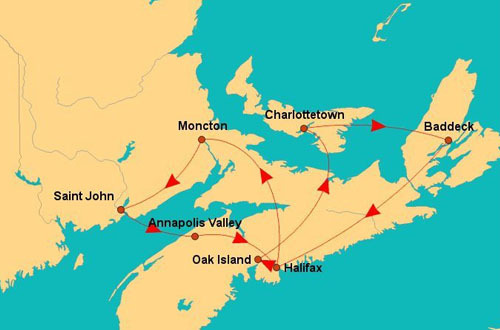 Today we depart for Halifax, taking time to learn about the French Acadians who established their first settlement in the early 1600’s. We enjoy a local winery tour and tasting before arriving in Halifax for the evening. Overnight in Halifax. Breakfast included. Discover the rustic charm of the renowned fishing village of Peggy’s Cove where we will enjoy breakfast. Afterwards we journey along Nova Scotia’s South Shore to the UNESCO World Heritage Town of Lunenburg, home to fleets of Grand Banks fishing schooners. Take a walking tour to fully experience one of the most remarkably preserved colonial settlements in the New World, and visit the Fisheries Museum of the Atlantic to learn about the town’s famous seafaring heritage. 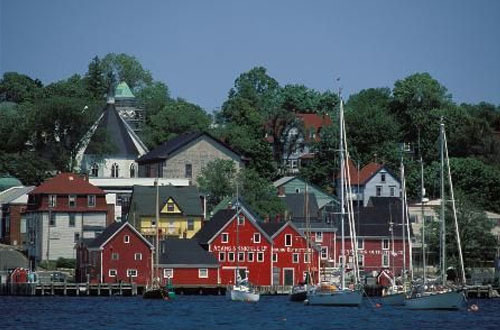 Later, we are off to Mahone Bay where a trinity of 19th century-built churches represents an iconic cultural landscape of Nova Scotia. Enjoy some free time to stroll through the town before we continue on to Western Shore for the night and the legendary Oak Island – home of the world\'s longest running hunt for lost treasure. Overnight on Oak Island. Breakfast and dinner included. Once only accessible by ferry, today we arrive on Prince Edward Island via the Confederation Bridge - the world’s longest continuous multi-span bridge. En route, we learn about Mi\'kmaq culture at the Glooscap Heritage Centre & Mi’kmaq Museum. We are treated to true Maritime hospitality this evening at a traditional hall-style lobster supper before checking into our hotel for the evening. Overnight in Charlottetown. Breakfast and dinner included. Enjoy a free morning in Charlottetown or join a complimentary walking tour of the city. This afternoon, our tour of the island drives by red cliffs, white beaches, gently sloping sand dunes and green fields as we make our way to Prince Edward Island National Park. Before returning to Charlottetown, we visit Green Gables Heritage Site, the alluring inspiration of Lucy Maud Montgomery’s classic Anne of Green Gables books. We take in a theatre performance this evening by local entertainers at the Confederation Centre of the Arts (a substitution activity may be necessary due to the theatre schedule.) Overnight in Charlottetown. Breakfast included. After breakfast we board a ferry to cross over the Northumberland Strait back to Nova Scotia and proceed to ‘the Scotland of North America’, Cape Breton Island via the Canso Causeway. We visit the Alexander Graham Bell National Historic Site in Baddeck to learn about the many accomplishments of this genius who made his home on the island. Afterwards, we arrive at the Bras d’Or Lake and check into our hotel for the evening. Overnight in Baddeck. Breakfast and dinner included. Today’s journey takes us along one of the most stunningly picturesque drives in North America. The Cabot Trail winds around the rocky splendor of Cape Breton’s northern shore, ascending to the incredible plateaus of Cape Breton Highlands National Park. Look-outs offer unforgettable vistas of Cape Breton’s rugged coastline, creating perfect photo opportunities. Afterwards, we travel to the coast where we enjoy a whale watching boat tour (weather permitting) before returning to Baddeck for the evening. Overnight in Baddeck. Breakfast, picnic lunch and dinner included. We get a look into the early days of colonial life with a visit to the Fortress of Louisbourg National Historic Site. The vivid history of the region comes alive in this accurate reconstruction of one of the major settlements of circa 1744 New France. Roam the streets and chat with authentically costumed guides. After our visit we proceed along the shore of the Bras d’Or Lake to the mainland before continuing on to Halifax for one last night in the Maritimes. Overnight in Halifax. Breakfast included. A time for last minute shopping and farewells. Individual transfer to Halifax International Airport in time to check in for your return flight.